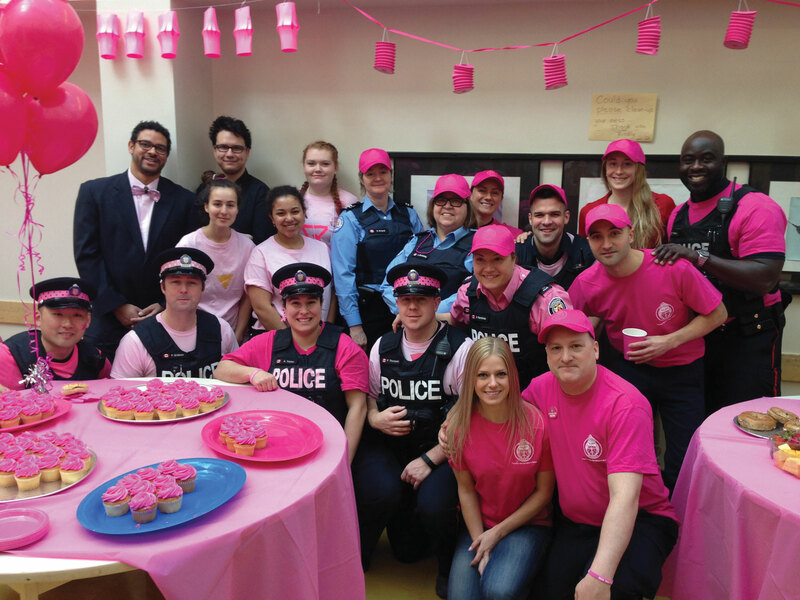 COURTESY JESSICA LEE/TORONTO DISTRICT SCHOOL BOARD School Watch Officer Andrea Harris (front row, third from left) was part of a group of officers from 14 Division who celebrated the Day of Pink at Harbord Collegiate Institute in April 2016. The Day of Pink is a worldwide event aimed at raising awareness to stop discrimination, gender-based bullying, homophobia, and transphobia. It was a novel idea: one cellphone, a shoestring budget, and a few bikes. All shared by the four police constables who made up 14 Division’s School Watch Officer (SWO) program. Together, they served ten schools west of Spadina Avenue, including Central Technical School, Central Toronto Academy, Harbord Collegiate Institute, and Heydon Park Secondary School. Available before, after, and during school, the officers ran programs (dodgeball every Thursday at Palmerston Public School), and got to know the school community. The program was cancelled this school year, swept up in the temporary suspension of the similarly named School Resource Officer (SRO) program, a suspension that a newly released Toronto District School Board (TDSB) staff report recommends making permanent. Approximately 36 police constables were assigned to 75 Toronto schools under the SRO program. It was created after a report into the death of a student at a Toronto school in 2007 recommended placing “more caring adults” in schools. However, the program has come under fire in recent years from groups like Black Lives Matter who say it promotes racial bias and is insensitive to students who are intimidated by the presence of a uniformed officer on school property. “The suspension and the ending of the [SRO] program is the direction we should be going,” said Ausma Malik (TDSB Ward 10, Trinity-Spadina), who co-authored the motion to suspend the SRO program pending a review. She said that the report “called for more youth workers, more counsellors, but it never said we should have uniformed police officers in schools. Malik said she was not aware that the SWO program, which she views as something very different, had also been suspended. Indeed, the two programs are quite different. While SROs usually used patrol cars to get around, SWOs favoured a two-wheeled approach. It’s not the only community-based program caught up in the suspension. Balazs Zanati, another 14 Division police constable, has spent considerable time working with Hungarian-speaking students at Parkdale Collegiate Institute. Part of the Community Response Unit, Zanati has been a member of the Toronto Police Service for eight years. Previously an officer in the Hungarian Army who served in Afghanistan before emigrating to Canada, Zanati heard reports of Hungarian-Roma students getting into fights and skipping classes, and decided to get involved. Zanati works with the students to help them realize the importance of getting an education. Getting the students to trust him was the hard part, he admitted. Harris had also started a program funded by ProAction Cops & Kids for Harbord students. ProAction is a grant initiative that funds programs that connect police and youth. It’s all for the same reason: while the suspension remains in effect, 14 Division officers cannot go on to school property without a call for service. Malik has said that was never the intent of the motion, and she’ll look into it.